You may have recently read Atila’s excellent piece on air cooling vs. liquid cooling. To briefly summarize how liquid cooling works, liquid (commonly water-based) is pushed through a series of tubes, blocks, and radiators by a pump in order to transfer heat from components such as a GPU or CPU to the air outside of a computer chassis more efficiently than a standard air cooling system. But one question comes to mind; is there a specific order that the components in a custom liquid cooling loop need to be in? Today we plan to give a short and sweet explanation of the recommended loop order. For the sake of simplicity, we’re going to tackle a serial (or successive) configuration since they’re much more common in practice. 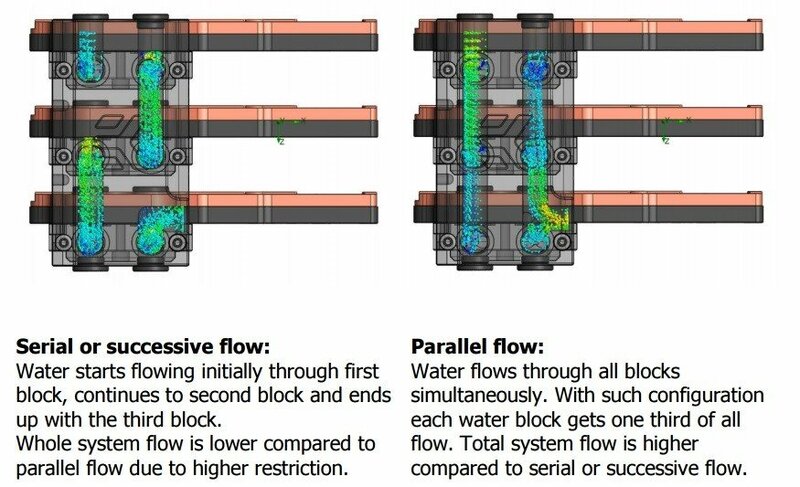 Here’s an illustration from an EKWB product manual comparing a serial configuration to a parallel configuration for water blocks. 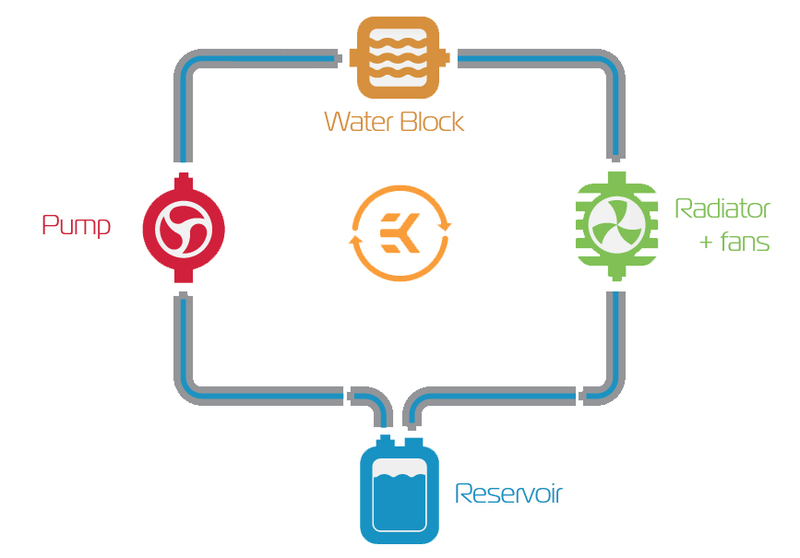 In a serial configuration, water flows in a direct line from one component to the next. But what’s the best order? Let’s explore that with a simple illustration of a loop. This handy graphic breaks down the liquid cooling loop into its simplest form. Starting at the bottom and moving clockwise, you’ll see that the reservoir feeds into the pump which then flows into the water block(s) followed by the radiator for exchanging heat with the surrounding air before finally completing the loop back at the reservoir. 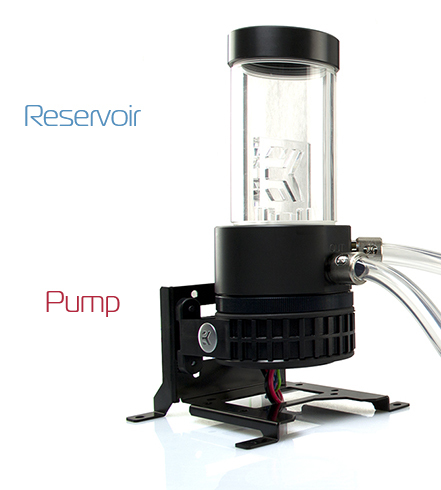 The best practice for custom loops is to have your reservoir feed straight into your pump for maximum flow. Pumps require liquid to be flowing through them for optimal operation, or else you risk premature damage to the pump (the liquid acts as lubrication in addition to keeping the pump itself from overheating – especially in the case of D5 pumps). 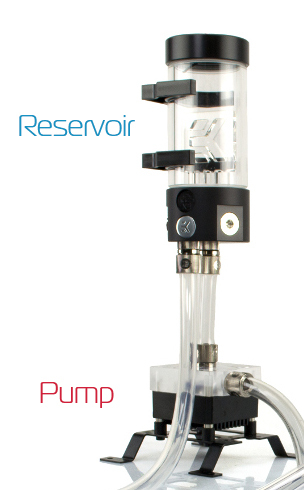 After the reservoir and pump, you can configure your loop in nearly any configuration you wish. One of the most basic questions in the beginning is the one of a separate pump and reservoir (left)or pump reservoir combo (right). What about more complex loops? It’s recommended to maintain high flow wherever possible to reduce the variance of temperatures across blocks in a loop. This becomes more of a concern if multiple GPU and CPU blocks are added to a single loop which add on to the overall restrictiveness of the loop, reducing the total flow rate and leading to slightly higher temperatures as the liquid travels through the loop. While this variance is usually only in the range of a couple degrees Celsius, it can have a slight effect on system performance in situations where you’re overclocking. This can be remedied by laying out blocks of similar restrictive properties (identical GPU blocks for cards in SLI/CFX) into a parallel configuration so that each block receives the identical flow and would in theory be at the same temperature. Radiators are usually placed just before the reservoir in order to remove heat before the pump, but you can also have radiators between arrays of blocks (largest radiator before GPU and smallest radiator before CPU for optimal thermal performance if your chassis can accommodate it). Always have the reservoir before your pump (pump/reservoir combos are already configured like this) and keep your loop simple, if aiming for a serial configuration (fewer turns caused by angled adapters = lower restriction). Also, consider using a parallel configuration when cooling multiple blocks of similar restrictive properties for more uniform flow (this practice is usually adopted for systems with multiple GPU’s). In our next blog we are going to take a closer look at radiators, specifically how big should they be and why. Hi. I’m thinking about water cooling and this loop order makes my brain hurt. Some people say just like you that the loop should be PUMP/RES > CPU BLOCK > RAD > PUMP/RES and some people say PUMP/RES > RAD > CPU BLOCK > PUMP/RES. Which one should it be? Basically, it is all the same. If you have a high-performance pump like a D5 or a DDC, it doesn’t really matter. The pump set to 50% of speed circulates the whole volume of the coolant in a few seconds. So, whatever the loop order is, you will get pretty much even liquid temperatures throughout the whole loop. Large and complex loops with multiple GPUs can show temperature variations between a few spots, but that is again nothing to be concerned of. It’s the super-geek-high-end who are worried about loop orders, they are also looking to get rid as many angled adapter as possible for higher flow so that they gain 1-2°C better results. Bottom line, build your loop in which order it is easier to connect it or based on your aesthetic needs. Just keep the pump fed with enough water and that is the only rule you need to worry about.